VIDEOS: Find out what it took for women to win the vote! And sign a petition for a federal holiday on August 26th! Decendants of Suffrage Movement Activists—Let’s rock the cradle! on Vimeo. Votes for Women: Honor our history! on Vimeo. There are millions of descendants of activists in the first wave of the women’s rights movement in the United States. Videos are one way of highlighting how many of these descendants have been working over the past few years to write this into American history. Sign the petition to make August 26th a federal holiday. Women’s Equality Day is important to American history. For one, on August 26, 1920, women were officially granted the right to vote in the United States after the certification of the 19th amendment. Fifty years later on August 26, 1970, feminists activists joined ranks on this day to remind our legislators that the buck doesn’t stop there. They organized a protest with over 100,000 women to campaign for equality in education, employment and childcare. On this same day in 1971, a national bill was passed to designate August 26th a day of prominence- Women’s Equality Day. Federal holidays are days recognized by our U.S. government. Usually, the holiday is deemed so important that federal offices are closed. Typically, banks, schools, and post offices refrain from regular activities on these days. The petition to elevate Women’s Equality Day is a call to action to ensure that the efforts of all women are recognized and included. 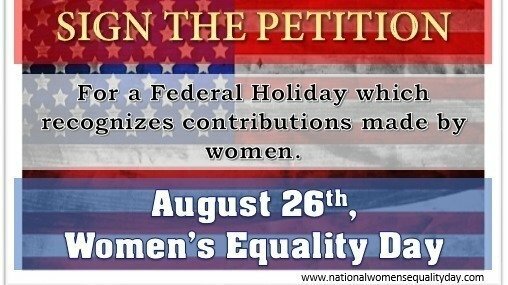 You can visit www.nationalwomensequalityday.com for future news and updates on this petition. Follow Suffrage Wagon News Channel. We have been publishing since 2009. Here at Suffrage Wagon, we’re serious about preparing for the 2020 suffrage centennial in the US. Follow the suffrage wagon to find out about the 2020 exhibition of the “Spirit of 1776” suffrage wagon exhibition in 2020. Places to visit include the Suffrage Wagon Cafe. Your host at the cafe—Marguerite Kearns. LetsRockTheCradle.com is a public service highlighting the upcoming 2020 votes for women centennial. SuffrageCentennials.com steers you in the right direction to find out what’s being planned for 2020. Happy birthday on November 12th, plus Suffrage Wagon headlines! VIDEO: Highlights of Suffrage Wagon News Channel! I am signing this petition. It’s a disgrace that US women aren’t guaranteed equality. What’s the problem? Is sharing power and responsibility somehow too difficult? Such a powerful video! So many people are descendants of activists in the first wave of the women’s rights movement and do not not even know it. It took a monumental effort to get women the right to vote. I am all for making August 26th a federal holiday for the purposes of commemoration.